If you buy -- or make -- candles with appropriately sized wicks, they'll create an even pool of melted wax every time. That melt pool is about more than aesthetics; it's a signal that your candle will provide reliable burn times and consistent fragrance throughout its life. Of course, how you handle the candles will make a difference in their burn times too. You can't really rescue a candle with a wildly inappropriate wick. A wick that's too small creates a feeble flame that tunnels down through the middle of a candle instead of melting wax evenly across the top, and it may burn out before it uses all the wax. A too-large wick creates lots of soot, burns through the wax too quickly, and may even create enough heat to damage the candle container or the surface beneath it. As a general rule, a candle made of soy wax or single-pour paraffin needs a larger wick than the same size candle made of base paraffin wax. Sometimes, one of the best ways around this kind of candle is to use multiple wicks in the same one, so their melt pools merge into one even pool across the top. The only way to be completely sure of how a wick/wax combination will perform is to make a test candle and conduct your own burn test. Every wick/wax combination is a little different, but, as a general rule, you should trim candle wicks to about 1/4 inch before every use. A too-short or too-long wick has the same adverse effects as too-small or too-large wicks, respectively. If you notice the wick listing off-center in the pool of melted wax, use toothpicks, skewers or other materials to prop the unlit wick back into place; once the wax cools it'll hold the wick in place. If you don't fix the off-center wick, it may create an off-center tunnel down through the wax the next time you light the candle. No matter what sort of wick your candle has, you'll get a better burn if you place it on a level surface in an area without drafts; the drafts will make the candle burn faster and a little sootier. 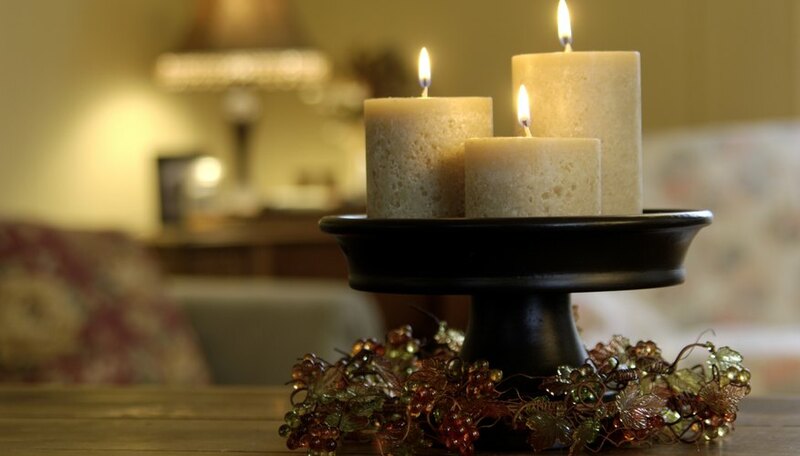 Your candle will also last longer -- and burn more evenly -- if you wait until the wax pool reaches all the way across the top of the candle before extinguishing it. That usually takes about an hour per inch of candle circumference.